Spartans may have gotten third place at the World Championship Finals, but after having the best performance of our lives, it felt like we won the gold. 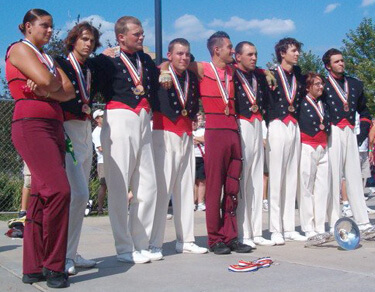 Here are nine of the 10 Spartans ageouts listening as the corps plays "Fire of Eternal Glory" for the last time of the 2006 season. Traditionally, the Spartans horn line plays after winning a contest - either an actual medal or the feeling of an amazing show. For the first time, the ageout brass players get to step out of the arc and listen to the line. From left to right is Shannon Dufault, a 10-year vet; Pat Russell; Brent Gilmore; Keith; Brian Breton; Anthony Montesian; Jon Norato; Kristina Lareau and Rob Lesley. We can truly thank the Spartans and DCI for providing us with the best experiences of our lives.